What do you think of my little tabletop Christmas tree? 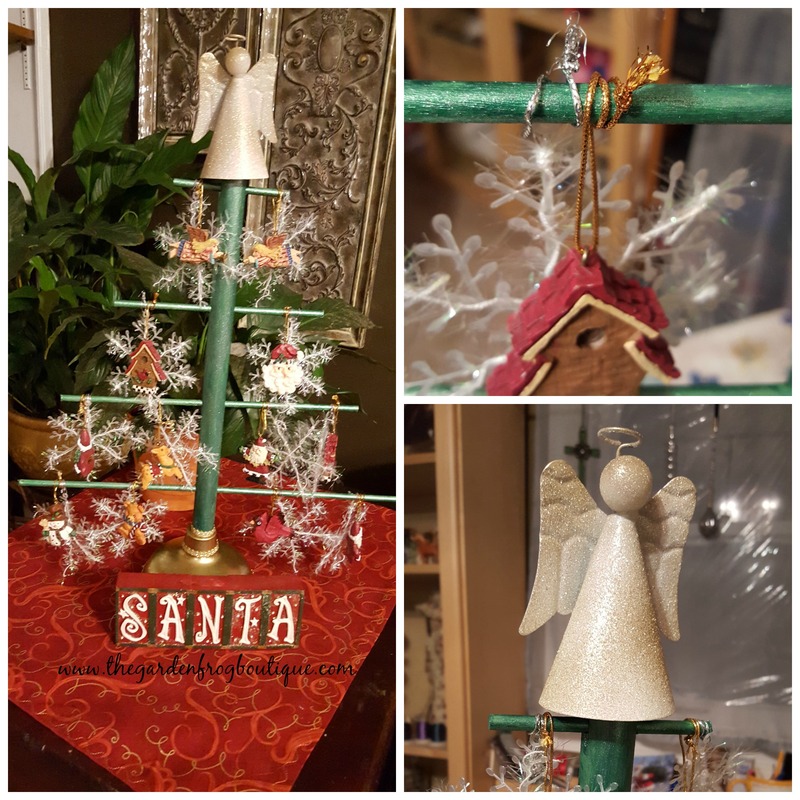 Would you believe the inspiration came as I walked up and down the aisles of my Dollar Tree looking for ideas for Christmas crafts? When you see what I used for the base of my tree, you will be surprised, shocked, and weirded out (at first). I know there are some really funky crafts on Facebook and Pinterest but I was not going for funky or weird- I just wanted to find something that no one else has done. Create a craft that kids and adults alike could create for less than $5. If you are already a crafter or DIYer, then you will already have a hot glue gun, ribbon, extra ornaments, spray paint, and acrylic paints. 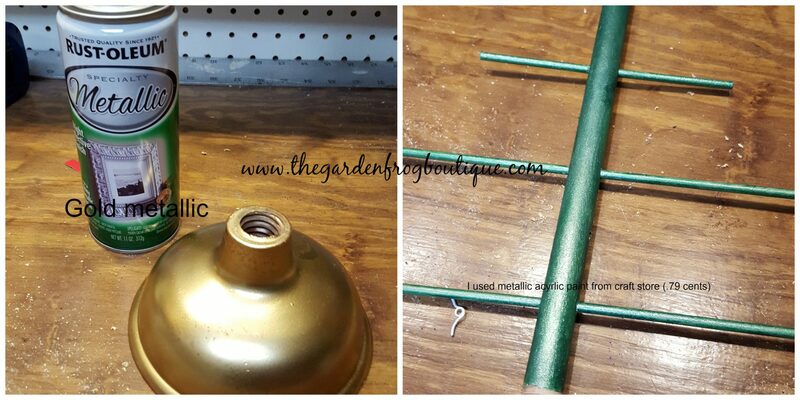 My favorite metallic spray paint is Rustoleum Metallic in gold and silver. I always have it on hand because you never know when inspiration will strike! The most difficult part is drilling straight through the plunger handle. It is soft wood that will splinter at the other side of the hole so go slow. It is very easy to go at an angle so mark carefully and hold drill straight up. I initally drilled every 2″ for many branches but I felt it was too many for this look so my holes are 4″ apart with the dowel cut at 4″, 8″, 12″, & 16. The lengths can vary with the decorations you will be using. 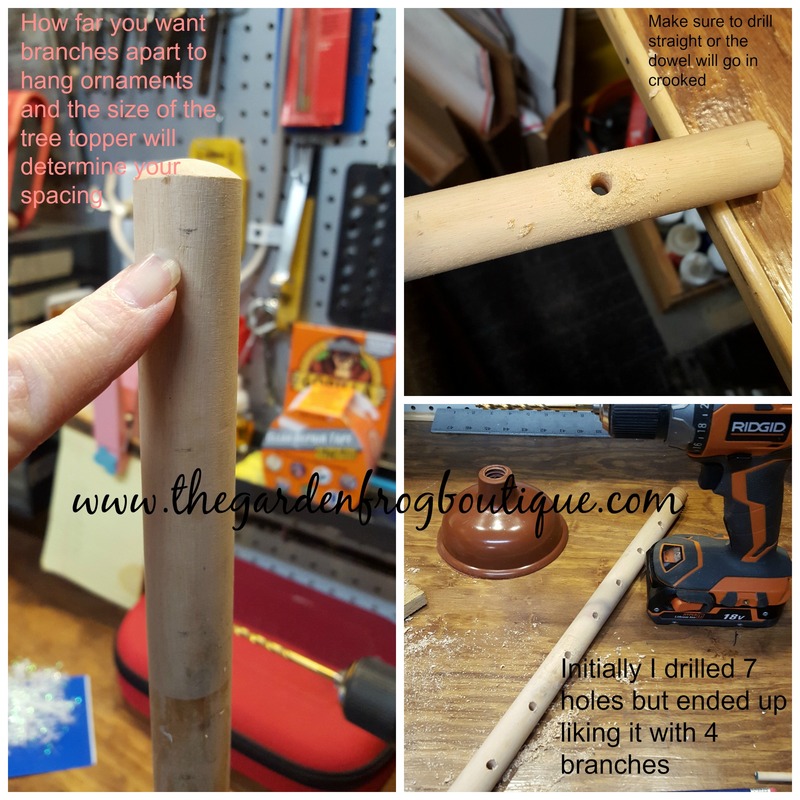 I also believe you could hot glue the dowels (or any other flat wood piece for branches) on if you do not have access to a drill and bits. Put the dowels in place and unscrew the plunger to paint. 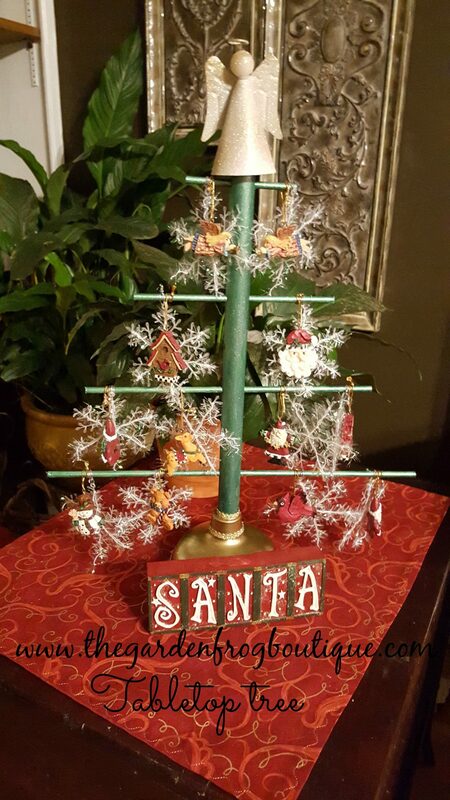 This could be a fun craft idea for the kids to create their very own Christmas or holiday tree in their rooms too. Plus if they make their own ornaments, it will be a holiday treasure for years to come. 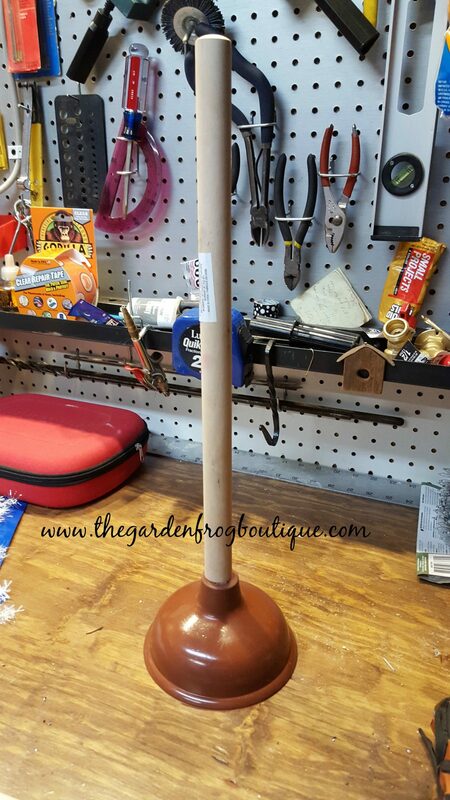 The cost of this project would be less than the price of buying one at the store and you can tell the funny story of how it began as a toilet plunger. I hope I inspired you to think outside the box. Thank you for visiting my site and Merry Christmas! Watch for my next one I create! How creative Renee! I love it, you did a great job on your table top tree. The plunger looks so much cuter as a tree then sitting by the toilet LOL . 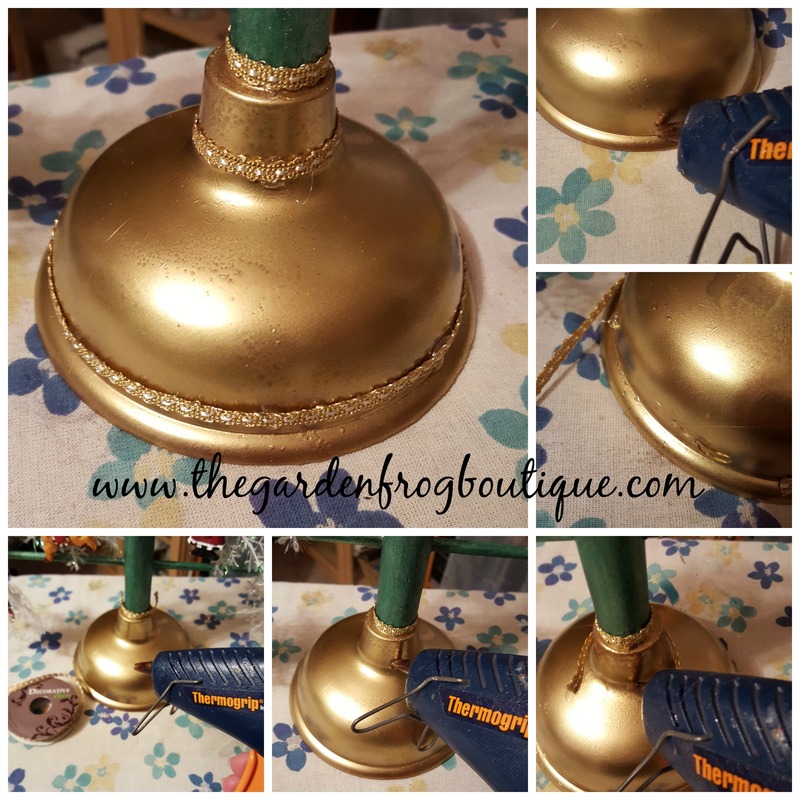 I like how you added the decorative ribbon around the plunger. Very nice !